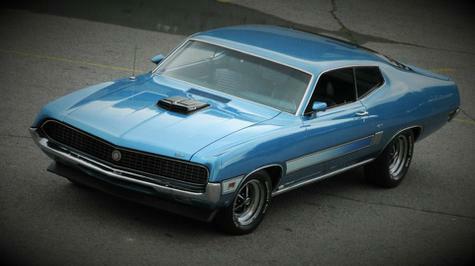 1970 Ford Torino GT, powered by a 429 Super Cobra Jet with C-6 auto and 3.91 "track loc" rear end. 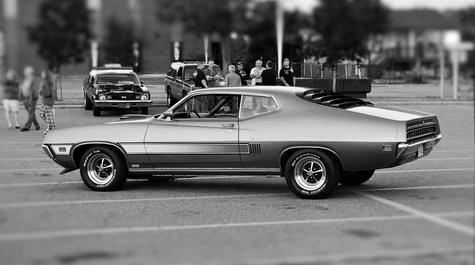 She is one of only 241 factory equipped "Drag pack" GT fastbacks made that year. 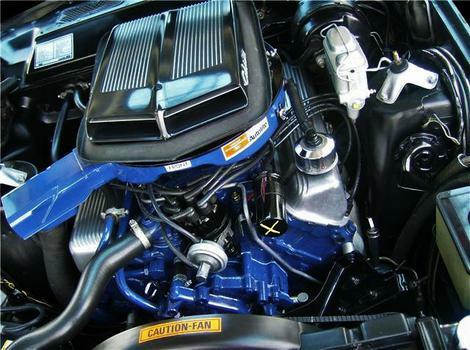 Key features includ, hide-away head lights, shaker, magnum 500 rims, louvers, front spoiler and laser stripes. 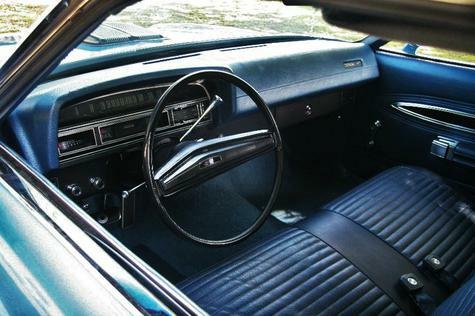 Other factory options include tach, AM radio, dual rear speakers and light group. My best ET to date is 13.1 sec. @107 mph...Not bad for a 4200 pound pavment ripper! 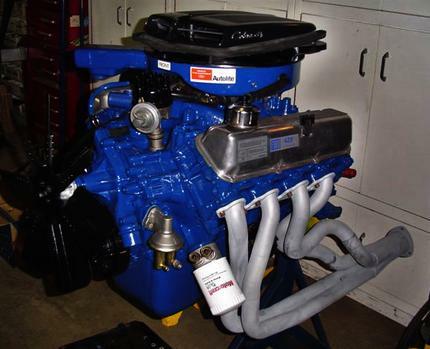 Back when my SCJ was rebuilt. Almost 10 years ago..... And still running strong! Thanks!.... Not to many still around! Thanks for your comment!.... Glad you like it! 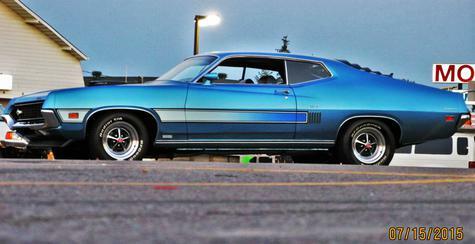 Just cruizin' around the site and spotted your gorgeous Torino. 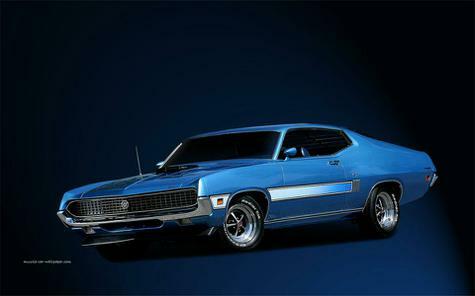 What a car !!! THUMBS UP !!! 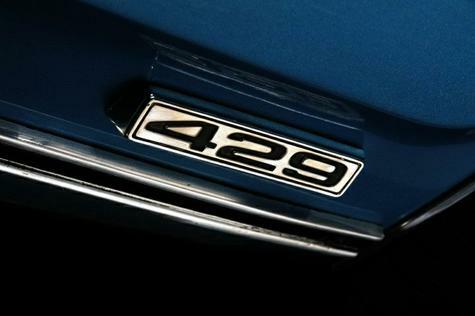 Love your car I have a sister car in Melbourne Australia that's 2 in 241 we need to find the other 239 friends..
My guess would be, all the ones in the wreck yards are all long crushed. 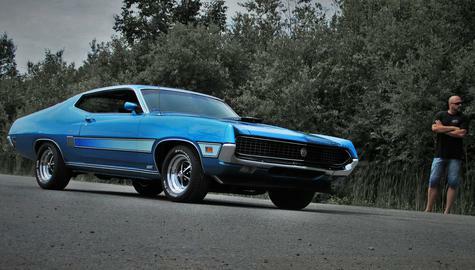 Since these rare beast hit collector car status, no one has sent one to the junk yards since the 80's. I would think that all the ones left to roth (if you can find some) are not SCJs. I did that smokey burnout a few years ago... It was a final farewell to my old BF's!.... Makes for great videos! ha-ha. Thanks for the compliment!.... That's one hell a great lookin' Vette! The 1963-67 models are my favorite Corvettes. 5 stars! OK, you got me...that is an AWESOME ride. Love the color and those stripes! 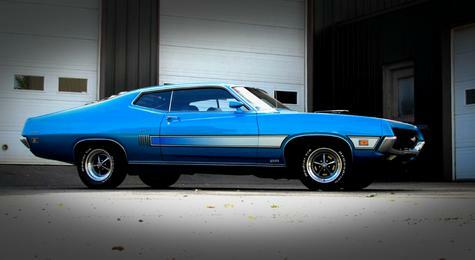 Thanks, Known as Lazer stripes, these were a factory option exclusively offered on the Torino GT in 1970. Actually my car was restored to look factory original, though the hide-away headlight option was added later on. 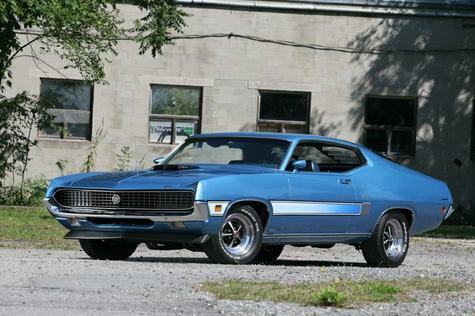 Great lookin' 70 Javelin you have there! We don't see many of those still around!